The Spitfire 4 has the speed, the control and the comfort for any sprint event. Plus, the 7-pin Pebax® spike plate gives this racing shoe enhanced traction where you need it most. 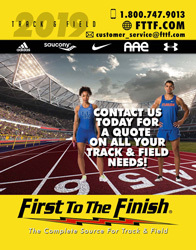 Question is, do you have what it takes to handle the best, bang for your buck, sprint spike on the market? Weight: 5.4 oz. | 153 g.
I got this shoe for my daughter and she loves them! Good fit and just enough aggressiveness for her. Fast times this season for her!